Over the years from high school to now, I have done some pretty horrible kinds of stuff to my hair. From hair dye, extensions, excessive bleaching, straightening, curling, until frying my hair using ironing tools, this prolonged hair-abuse activity has paid me with karma in the form of severely split ends, a depressing matte finish, and a flaky scalp. I have made an effort in recent years to reverse that damage by first changing the shampoo I use and then limit the hair wash once or twice only a week. Of course, it is not an easy job to find a perfect match shampoo. I might get a smooth and luminous hair, but then it will easily get drenched and smelly. Vice versa, I might get a good smell hair but only lasts a day. 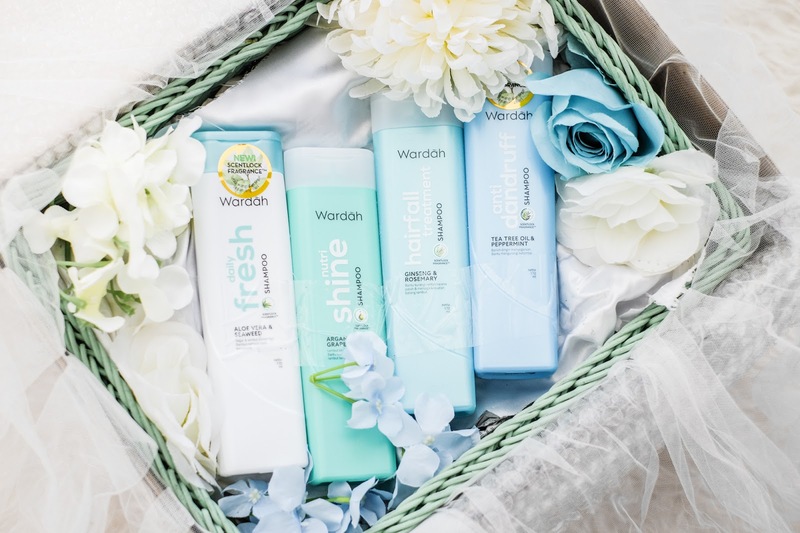 The searching of good hair shampoo makes me really skeptical until I am introduced to Wardah Shampoo Series and qualify the series to the must-try shampoo of the year! Wardah Shampoo Series has 4 different formula that will fight the most common hair problems like dullness, flaky heads or hair fall. Here, I will introduce the difference one by one. Refresh and softens hair with multi-action natural actives. 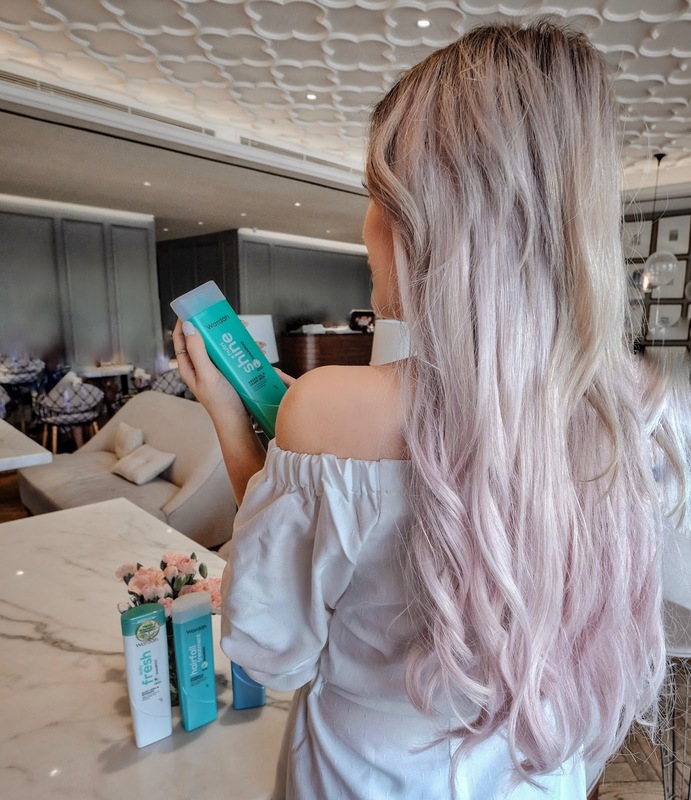 Aloe Vera Extract gives that refreshing good feeling, Seaweed Extract nourishes the scalp, and Wheat Protein softens hair strands. Letting out the shine of healthy hair multi-action natural actives. Argan Oil is known to nourish and protect every hair strand from damage, Grapeseed Extract that is famous for adding hair growth numbers, and Ceramide that reduces hair splits. Help prevent hair loss with the combination of multi-action natural actives. 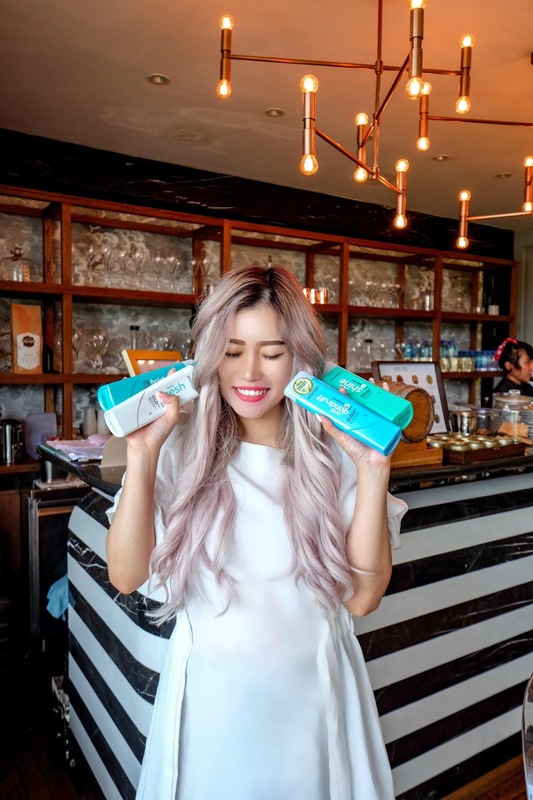 Ginseng Extract prevents hair fall, Rosemary Extract is known as a good nutrient for the scalp, and Keratin keeps the strength of every hair strand to prevent breakage. Cleanse and help solve dandruff problems with multi-action natural actives. Peppermint Extract calms the scalps with fresh cool sensation, Tea Tree Oil helps reduce the amount of dandruff and Double Zinc Active TM protects the scalp from developing dandruff. As mentioned above, I would qualify the shampoo that can effectively reverse my damaged hair to a positive improvement such as more smooth, shiny, and no more flaky scalps. I opted to try these series due to its multi-action natural actives that vary from Aloe Vera, Argan Oil, Ginseng Extract to Tea Tree Oil. I am such a believer in natural actives, it won't be disappointing. Before going into the hair wash result, I would like to highlight the shampoo packaging. It's all simply fresh, eye-catching and color-coordinated one to another. 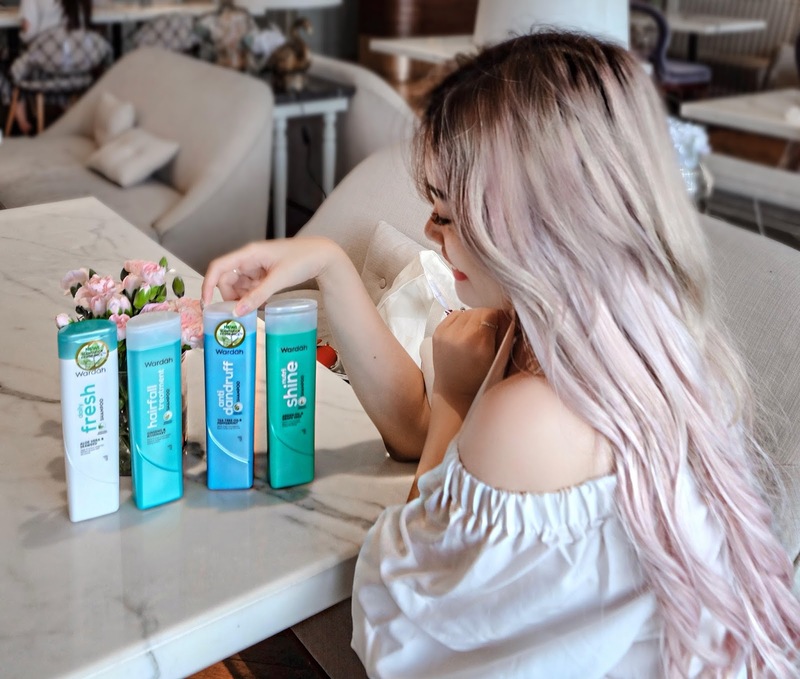 The daily fresh shampoo is packaged in a white tube, the Nutri-shine shampoo is packaged in a green tube, the hair fall treatment shampoo is packaged in a tosca tube and lastly, the anti-dandruff shampoo is packaged in a blue tube. With tall skinny tube and plastic flip lid, the shampoo can be easily handled with one hand. On the other note, the smell of the shampoo is something to rave about. I personally love the Scentlock Fragrance formula in all the series, the aroma is pretty much the same one to another. I am the one who savors a perfume fresh scent post hair wash and Wardah successfully make me wants to smell my hair again and again. The hair perfume is very addictive! I tried washing my hair using the anti-dandruff shampoo in the first week and the Nutri shine shampoo in the following week. After several washes in my first week, my scalps felt like it were able to breath easier. I found no residuals or flakes, plus the after wash sensations are cool and refreshing! Following the second week experiment, I noticed my hair gets smoothen and shiny as well. With only two weeks, I experience positive improvement in my hair quality. I will definitely continue the treatment using these shampoos from Wardah. Wardah Shampoo Series can be purchased the at the nearest drugstore, mini market or online stores at a very affordable price that won't make your wallet empty. A good shampoo makes all the difference and these ones sound super good! Thanks for reccomending! wih shampo dari wardah, aku mau coba ah..